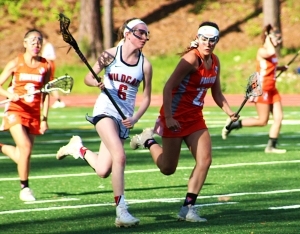 Hardnosed defense proved to be the winning formula for the Dunwoody Wildcats as they rallied from a 4-1 deficit to defeat Parkview 9-5 on the way to securing the program’s first home playoff game on May 2 against the Region 3-6A-7A No. 3 entry. Parkview had the upper hand early in the game at North DeKalb Stadium jumping out to a 3-0 lead in the first quarter on goals by Jason Hauch (11:02), Jack Brunson (9:53) and Andrew Marshall (2:38). Dunwoody’s Nick Fazzone converted a nice assist from teammate Zach Rossing into a goal with 9:46 left in the first half to cut the lead to 3-1. The Panthers (9-5, 3-2) answered just over a minute later as Brunson got his second goal of the game to make it 4-1. That was a big turning point as the Wildcats (9-4, 5-1) turned up the heat defensively with some hard checks and packing it in out front of the goal to limit Parkview’s opportunities at easy shots. Goalie Adam Hydrick stepped up his play as well making 16 saves in the game after giving up the three quick goals in the first quarter. Parkview scored just one more goal in the final 32:16 of the game while the Wildcats would put eight on the score board. Sean Fox scored on a pass from Carson Bregitzer with 6:09 left in the first half and Bregitzer was rewarded for his efforts with a nice pass from Drew Koehler trim the lead to 4-3 with 5:54 left in the half. Dunwoody had a player called for being in the crease to disallow what had looked like the tying goal with 3:45 to play. Parkview would go into the half holding a 4-3 advantage. Third quarter goals from Rossing and Connor Brogdon put the Wildcats ahead 5-4 with 5:04 left in the period. Peyton Haislip would find Brunson open for a goal as Parkview knotted the game at 5-5 heading into the fourth quarter. But the Wildcat defense had set the tone holding Parkview scoreless for 19 minutes to get back into the game. 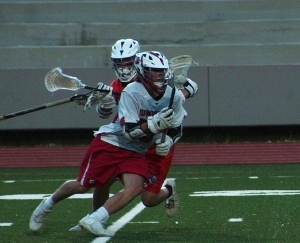 Dunwoody scored four unanswered goals in the fourth quarter with Fox scoring two to get the hat trick in the game. Fox opened the fourth quarter driving the middle of the Parkview defense for a goal (11:05) and then slinging a 15-yard bullet (6:42) past goalie Devin Kotowski. Carson Carroll added a goal with a drive from the right side (10:13) and Connor Reid capped the Wildcat win with a shot from the right side that found the corner of the net behind the goalie for the final score of 9-5). The Wildcats more than likely will face North Paulding in the opening round of the Class 7A-6A state playoffs. Sydney Trammell scored early in the second half to make it 6-1 in favor of the Panthers before Dunwoody’s Phoebe ringers used a penalty call on Parkview to score and make it a 6-2 game with 22:22 to play. Ellie Levy finished out the Dunwoody scoring with a goal at the 10:11 mark that stopped a 4-0 run by Parkview and made the score 10-3. Dunwoody fell 6-4 overall and 3-1 in region action. Parkview improved to 10-5, 3-2 on the season.